My name is Kay and I am addicted to Subway. 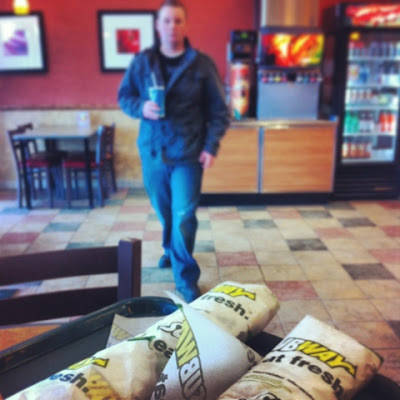 I haven’t been able to stop thinking about Subway since my husband and I had lunch there on Sunday. I have gone through a lot of different phases with Subway. I was in love with the turkey and provolone at first, then it was the seafood (sorry to gross you out if you hate seafood), now it is the buffalo chicken on flat bread. That is what I had for lunch and dinner on Sunday. I split my 12 inch between the two meals and it was a very good day! I think that subway will be seeing me very soon; especially since we have one gift card left. Consider it spent. Last night my husband and I went to the gym as soon as I got home from work. We use the free gym available at our local school district. The high school is not too far from our house so it’s convenient and affordable. Who can’t afford free, right? When my husband and I got to the gym, the only two working treadmills (I said it was free…) were being used. We decided to do some work on the stationary bikes while the two people “finished up” on the treadmills. After 10 minutes, I decided to try the rowing machine. I peaked at their time on the treadmill and it was almost 45 minutes. I spent a little time trying the rowing machine for the first time (which was super fun) and decided to peak at their time again. It was nearing an hour. I was a little frustrated because all I wanted was 10 measly minutes to warm up, run and cool down. Just 10! When it got over an hour and they were still on the treadmills, I decided to give one of the barely-working treadmills a go. This particular treadmill is fairly dangerous as the belt is loose and makes you almost fall every two minutes; but I used it and got my run in for the night, anyway (*without falling*). When we left, the treadmill people were still going strong. Darn you, treadmill people! Share. After the gym, we walked in to our house and were instantly hungry. It smelled amazing as soon as we walked through the door. 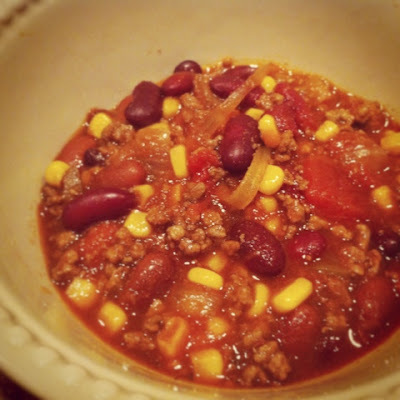 I had thrown all of the ingredients for our favorite Simple Slow Cooker Chili in the crock pot early that morning. That was easily the best idea I had all day. It was really nice to have dinner ready for us as soon as we were ready for it; and we were ready! I almost forgot. The gym is going to be closed on the 14th – 18th. This is changing up my workout plan for the rest of the week, and will impact next week, too. That’s the new plan. Let’s hope I remember not to go to the gym on the days it’s closed! What’s your favorite machine to use when working out? I want to try a rowing machine but there is only 1 at my gym and I'm chicken!!! Training wise it is the treadmill but I like the elliptical because I can read or watch a show an work up a sweat. I absolutely hate the rowing machine plus I'm a little chicken too, lol. Good job getting your workout in. How rude of them to hog the treadmills. That chili looks amazing. Is there a recipe?